Yazoo (known as Yaz in North America for legal reasons with Yazoo Records) were a British synthpop duo from Basildon, Essex, England, consisting of former Depeche Mode member Vince Clarke (keyboards) and Alison Moyet (vocals). 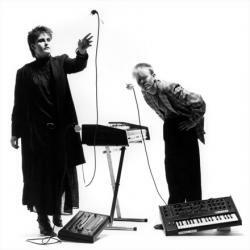 Formed in late 1981 after Clarke responded to an advertisement Moyet placed in a UK music magazine, over the next 18 months the duo made two critically acclaimed albums, Upstairs at Eric's and You and Me Both, blending Clarke's synthesizer melodies with Moyet's blues- and soul-influenced vocals. Yazoo enjoyed worldwide success, particularly in their home country where three of their four singles reached the top three of the UK Singles Chart and both their albums made the top two of the albums chart. In North America they are best known for the song "Situation", originally only a B-side in the UK but which was a club and airplay hit in the US and Canada before being released as the band's debut single in North America. Despite their success, the duo split acrimoniously in May 1983 due to a combination of Clarke's reluctance to make more records under the Yazoo name, a clash of personalities, and a lack of communication between the pair. Clarke went on to form Erasure, another successful and longer-lasting synthpop duo, while Moyet embarked on a solo career. Although their musical career was short, Yazoo's combination of electronic instrumentation and soulful female vocals has been cited as an influence on the house music scene that emerged in the mid-1980s, as well as bands such as LCD Soundsystem (who name-checked them on their debut single "Losing My Edge"), Hercules and Love Affair (whose leader Andy Butler has said that "Situation" was his biggest musical inspiration as a child), La Roux, Shiny Toy Guns and Blaqk Audio.